Another morning of rising at 4:30 and getting to breakfast at 5 AM. I will really miss my morning walk in the dark with the crisp cool air nipping at my nose. The rest of me is well bundled up since I want to avoid getting chilled and tensing up which causes my joints and muscles to scream at me. There's a bit of faith involved in walking the dark roads and paths to the dining area and I've loved the challenge and feeling of accomplishment. 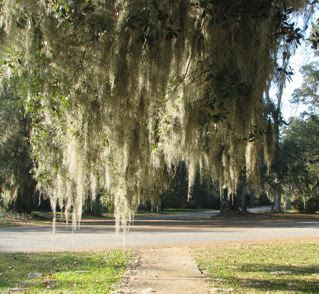 The walk from my trailer to the road goes by some live oaks that are draped with Spanish moss that hangs over the path. I'm usually right on top of them before I lean to the left to avoid them. At first it was an eerie part of the journey, but now it's like the moss has become a friend. I met another resident today. 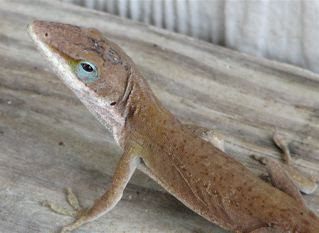 A large anole (more commonly known as chameleon) was climbing in one of the large umbrellas they keep on the porch that runs the length of the trailer. I actually looked inside to find one since the shopkeeper informed me they love to hide in there while it's chilly, so I figured we'd have one in an umbrella also. There were actually three. Two little ones and one big grandmother type. She wasn't very happy with me picking her up, but I just had to have some critter play. She seemed to be enjoying the back rubs because when I tried to let her climb off my hand she just stayed. Somebody came up the walkway and she then scurried back into the umbrella. 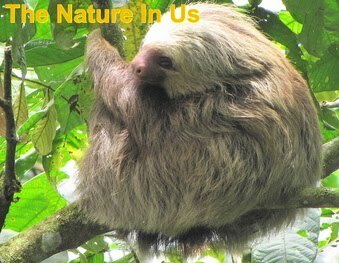 What a delightful encounter with one of God's critters. There's a place called Strawberry Chapel a few miles down the road and it seemed like a great day for a short drive. It was a lovely setting with the church grounds mostly being used as a cemetery. I chose the enclosed area that looked like the oldest and was surprised to find that it seems to have been vandalized. I'd never seen anything like it. There were monuments knocked down, parts of crosses chopped off and marble tops to the tombs were broken or tossed on the ground. The chapel had wrought iron bars on it so I suppose being so far out in the country without any homes or town nearby it became somebody's folly to tear it up. It was located by Childsbury Towne, a historical area that had been alloted so you could walk down to the Cooper River where there had been a ferry for the rice plantations to get their goods across the river. After a week of peace, quiet, beauty and rest, today's journal includes a few moments of great unrest and sadness. I was sitting on the pier at the ferry area, and since I forgot my cord to download the photos to my computer, I was reviewing and deleting unwanted photos to have room for more. There was a cormorant sitting nearby that didn't seem to mind me at all and a Great Egret not much further, so I wanted space to get their pictures. I haven't toyed around much with all the digital choices on the menu of the camera. I try to keep it as simple as possible, but I decided to go through the options wondering if it was still set on large format for the best pictures. To make it short and sweet, I pushed the wrong buttons and in two seconds all 171 of my photos for the week were gone. The cormorant seemed to yawn as I sat there and cried over the matter. The Great Egret flew away with no concern at all. It seemed like the rest of the world was just okay with it. I felt like somebody had taken away my entire week since I see memories through my photographs of places. Well, those were the feelings, not the facts. After a few minutes, I said, "Okay, Lord, this one didn't surprise you and I don't know what you have in it, but I'm not going to whine about it." 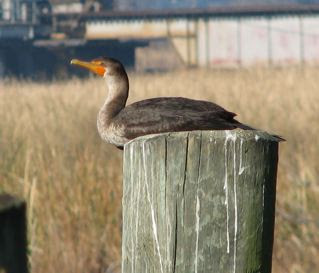 I took a couple photos of the cormorant and headed back to the car praying that the photos would reappear since I had chosen to have faith that all was well regardless ... although I had to giggle at the thought. They didn't, of course, but I did have the day to wander the grounds and take some of the scenes I'd had before. The lighting was different and I didn't take many of the flowers that were in bloom. What I really missed were the bird photos I'd taken, but I did get others and shall seek more opportunities tomorrow on my last day here. Chris and John have taken the rooms that John and Chuck were in before. Chris brought a sketch pad and while I was down by the river I saw the beginnings of a sketch of the tiered lawn in the gardens. I'm always fascinated how somebody can transfer a scene or object onto paper. It's almost like a miracle to me because I've tried it and can't even make stick people look good. One day a friend of Michelangelo saw him working on a piece of marble he'd found on a rubbish dump near Rome. When he asked the master sculptor what he was doing, he replied, "There's an angel inside and I'm going to bring him out." From a rubbish dump to a masterpiece. Reminds me of what God does with our lives if we let him. Unlike marble, we do have free will. I encourage you to stay where the Lord has you today an let Him keep working on you. Tomorrow you'll be a masterpiece. It's wonderful how unique God makes each of us. I used to be envious of somebody that could paint and sketch, but after I got sick of that, I decided to find my own skills and talents and focus on enjoying them. Photography is one of them and I do have a grand time of it. After enough friends told me I need to write, I've also found that I enjoy sharing experiences in written format ... and I enjoy being used of God to write some of His thoughts also. Today I decided that my favorite food here has been the homemade whole grain breads. The reason I thought of it this evening is because the only choices were white breads. They were homemade and more like Italian bread, but I missed the whole grain choice at dinner tonight. This is the last night that I will go to sleep thinking about waking up to another beautiful day here. Tomorrow will be my last. As I strolled the now familiar grounds today, I thought about how wonderful it would be to live on such a place. To spend time each day looking at what God has going on in nature. He created it for our enjoyment and I enjoy it more than any other form of entertainment. I know I will be sad to leave ... but also excited to return to my own home, my husband and my snuggling kitty.